Published for the first time in English, Panorama is a superb rediscovered novel of the Holocaust by a neglected modern master. One of a handful of death camp survivors to fictionalize his experiences in German, H. G. Adler is an essential author—referenced by W. G. Sebald in his classic novel Austerlitz, and a direct literary descendant of Kafka. When The Journey was discovered in a Harvard bookshop and translated by Peter Filkins, it began a major reassessment of the Prague-born H. G. Adler by literary critics and historians alike. Known for his monumental Theresienstadt 1941–1945, a day-by-day account of his experiences in the Nazi slave-labor community before he was sent to Auschwitz, Adler also wrote six novels. The very depiction of the Holocaust in fiction caused furious debate and delays in their publication. 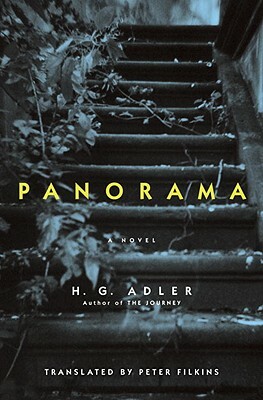 Now Panorama, his first novel, written in 1948, is finally available to convey the kinds of truths that only fiction can. A brilliant epic, Panorama is a portrait of a place and people soon to be destroyed, as seen through the eyes of young Josef Kramer. Told in ten distinct scenes, it begins in pastoral Word War I–era Bohemia, where the boy passively witnesses the “wonders of the world” in a thrilling panorama display; follows him to a German boarding school full of creeping xenophobia and prejudice; and finds him in young adulthood sent to a labor camp and then to one of the infamous extermination camps, before he chooses exile abroad after the war. Josef’s philosophical journey mirrors the author’s own: from a stoic acceptance of events to a realization that “the viewer is also the participant” and that action must be taken in life, if only to make sure the dead are not forgotten. Achieving a stream-of-consciousness power reminiscent of James Joyce and Gertrude Stein, H. G. Adler is a modern artist with unique historical importance. Panorama is lasting evidence of both the torment of his life and the triumph of his gifts. H. G. Adler was the author of twenty-six books of fiction, poetry, philosophy, and history. A survivor of the Holocaust, Adler later settled in England and began writing novels about his experience. Working as a freelance writer and teacher throughout his life, Adler died in London in 1988. Peter Filkins is an acclaimed translator and the recipient of a Berlin Prize fellowship in 2005 from the American Academy in Berlin, among other honors. He teaches writing and literature at Bard College at Simon's Rock in Great Barrington, Massachusetts.